This early work by Rachel Field was originally published in 1942 and we are now republishing it with a brand new introductory biography. 'And Now Tomorrow' is a best-selling novel that was adapted into a film in 1944. Rachel Lyman Field was an American novelist, Poet, and Children's author, born in New York City, United States, on 19th September 1894. Field went on to produce many works of both adult fiction, plays, and children's fiction. Her most successful children's work was Hitty, the First Hundred Years (1929), which received the Newbury Award in 1930, for the year's “most distinguished contribution to American literature for children.” This title, along with the posthumously published Prayer for a Child (1944), was named to the Lewis Carroll Shelf Award for being considered to belong “On the same bookshelf” as Carroll's Alice. 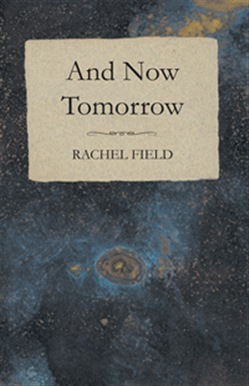 Acquista And Now Tomorrow in Epub: dopo aver letto l’ebook And Now Tomorrow di Rachel Field ti invitiamo a lasciarci una Recensione qui sotto: sarà utile agli utenti che non abbiano ancora letto questo libro e che vogliano avere delle opinioni altrui. L’opinione su di un libro è molto soggettiva e per questo leggere eventuali recensioni negative non ci dovrà frenare dall’acquisto, anzi dovrà spingerci ad acquistare il libro in fretta per poter dire la nostra ed eventualmente smentire quanto commentato da altri, contribuendo ad arricchire più possibile i commenti e dare sempre più spunti di confronto al pubblico online.